Scottish Borders Council chief executive Tracey Logan. Scottish Borders Council’s six top earners are paid almost £600,000 a year between them, it has been revealed. The biggest chunk of that £575,500 wage bill goes to chief executive Tracey Logan, her salary for the financial year 2017-18 being £120,878. 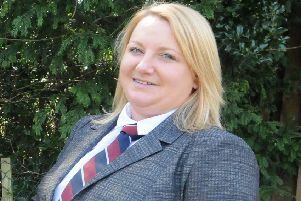 She is one of only two council employees banking six-figure sums, the other being SB Cares managing director Philip Barr on £106,906. Services director Rob Dickson and Donna Manson, formerly service director for children and young people but now chief executive of Highland Council, were both paid £87,849. Chief financial officer David Robertson is the council’s fifth biggest earner, on £87,140, and Martin Joyce, service director for assets and infrastructure, isn’t far behind, on £84,825 for the same period. However, Ms Logan and other directors agreed to a voluntary pay freeze in 2014 to help with council cutbacks. The figures have been released by the TaxPayers’ Alliance, a right-wing pressure group campaigning for lower taxes, as part of its annual town hall rich list. A council spokesperson said: “Scottish Borders Council has reduced the number of officers paid salaries of over £100,000 in recent years, from four in 2011-12 to the current number of two. “Our salary levels are set by reference to national agreements and reflect the scale and responsibility associated with the management of a complex public-sector organisation with gross annual turnover of £300m. “The council is well aware of the challenging financial times we are faced with. The spokesperson added that Ms Logan’s salary is lower than most of her peers, with 21 out of Scotland’s 32 council chief executives earning more. “The average council tax bill has gone up by more than £900 over the last 20 years and spending has gone through the roof.